For those who saw him bat the talent of Barry Richards puts him with a small group who are mentioned after Don Bradman: Sachin Tendulkar, Viv Richards and not all that many others. His Test career was almost entirely sacrificed in the cause of ending apartheid in South Africa and prompted, at least in part, by a feeling that cricket goers now are not as aware of him as they might be, Andy Murtagh’s biography is a view of a team-mate that reveals a fair bit about the man as he lauds the player. Among the most interesting observations are those made by the author (and also Robin Jackman at one point) on what it was that made Barry Richards such an exceptional batsman: forensic powers of observation from his extraordinary eyesight that let him see which way the seam on a ball was rotating (and so which way it would it would spin), his capacity to remain still until he had decided to play forward or back and the great speed of his reactions when he had. In short gifts from nature that go with being a cricketing genius; a master technician, an innovator who was temperamentally given to attack. It was characteristic that he really excelled when presented with conditions or circumstances that others would find difficult, announcing himself in England with an innings of 70 made out of a total of 122 when he had just started with Hampshire on a rain affected (‘S shaped’) pitch at Harrogate. 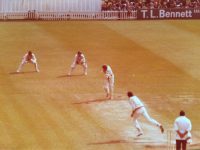 The innings that stand out in the memory of this blogger are one of great care, 37 not out, but getting the better of Bishan Bedi in a match that went a long way to deciding the Championship in 1973 and also a brilliant Sunday League century in 1975, against a strong Leicestershire team that anticipated rather the way the game would be played in the T20 era, giving the pavilion roof at Dean Park a difficult afternoon in the process. At his best the effect he had on spectators was electrifying. His Test career was over by 1970, after a series in which the South Africans defeated Australia 4-0, playing 4 matches in which he averaged 72, some happy seasons at Hants followed in which he and Gordon Greenidge formed an opening pairing that might be thought to compare with any in the history of the game; his partner going on to establish himself in the West Indian team that dominated from the mid-late seventies onwards. 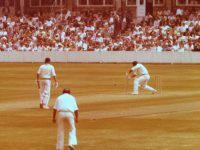 Towards the end of his time in England it would be fair to say that he was not greatly motivated by playing seven days a week on the county circuit, and his mid-season exit in 1978 while a relief to him personally, could have been made in happier circumstances than a rain-affected match at Grace Road (above). Andy Murtagh does a good job making it clear that he was more at home in the Southern Hemisphere, that he had a certain liking for Adelaide that was not felt for 1970s Southampton. It is not a short book and there is quite a lot of detail about the development of his career, the 1970 Test series in South Africa, his innings of 356 in Australia and later his performance in WSC which hint at the career that might have been (5 supertests, an average of 79). Later chapters remind how good he was as a commentator-summariser, comparable to say Michael Atherton in clarity and sharpness, and also chronicle his career as a cricket administrator. Those with exceptional talent that sets them apart do not always have easy lives and the observation that Barry Richards is a private man is made more than once in Sundial in the Shade; at ease with his friends from Durban High School, someone who came to tolerate autograph hunters as part of the job, but who did not appreciate particularly those whose search for stardust or whose curiosity took them beyond the limits of the public realm. The point is made that he regrets not having made more friends in his time at Hampshire, although Andy Murtagh’s essentially sympathetic appreciation gives readers some understanding of why he did not. In other circumstances Barry Richards may or may not have scored more runs than Graham Pollock or Brian Lara, or given as much or greater pleasure to those watching as either of them. For those who didn’t see him at all, there is a lot in this book about what he achieved in first-class cricket and if Sundial in the Shade can only go so far in persuading readers about how good he was, the ESPN legends of cricket (on youtube) gives some sense of the extent to which he was respected, revered as a player, by those that did have full careers at the top level of the game.